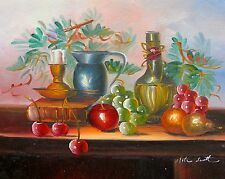 This is a hand signed original painting by Matt Scott titled "Fruit, Candle and Wine". 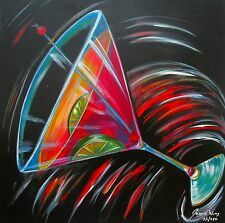 Beautiful original oil painting on canvas. Rich vibrant colors! In nice condition. Rafuse canvas print. 39“ L x 19“ H x ¾” W.
MURILLO SIGNED PAINTED PAINTING WITH WOOD FRAME. BOTTLE OF WINE AND FRUITS. USED AS IS. DO NOT KNOW IF THE SIGNED BY MURILLO IS CORRECT. BOTTLE OF WINE AND FRUITS. PAINTING; 12 IN. This is a hand signed original giclee on canvas titled “LIBER PATER” by Noah. Universal Studios sought Noahs expertise in designing the vehicle for the Suki vehicle in “2 Fast 2 Furious”. Born and raised in Orange County, California Noah grew up to be one of the most well know artist in the country and around the globe. I always wanted to compete; my talents have made my only playing field my aisle. This subject is numbered from an edition of 250. "I paint things the way they look when I'm actually there", says Mr. Srite. "If I can see it, it's in the painting.". This subject was a sample giclee produced from the original in 2003 and only one was produced. Genuine Original Antique Lithograph Print, NOT a modern reproduction. Own a piece of history with this original print. Plus, it preserves a 115 year old item. This is aPierre Auguste Renoir offset lithograph titled “The Onions” (year of original: 1881). These reveal his extraordinary ability to depict the lustrous, pearly color and texture of skin and to impart lyrical feeling and plasticity to a subject; they are unsurpassed in the history of modern painting in their representation of feminine grace. 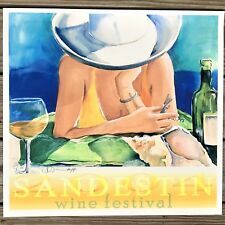 Sandestin Wine Festival. By Donna Burgess. Signed and Numbered. Artist: Cassandre (Aldophe Jean-Marie Mouron). Dubonnet.a l'eau. The chromist (trained colour specialist) adjusts each colour by look and feel to perfectly match the original artwork. Publisher/Printer: S2 Art Group, Ltd.
On heavy duty paper. Has orginial plastic sleeve sleeve. As a photo realist Goings neither glorifies or censures; but his objective rendering does often reveal the visual beauty and fascination of the pictorial subject. A hamburger stand may be one of the more typical symbols of our urban sprawl and convenience culture but, as Goings' paintings show, it may also be visually engaging precisely because of its synthetic qualities and the variety of texture, light play and reflections they afford. As beautiful as our Canvassed Arts are, and as near in appearance to the original artwork as they can be, you always have the option of making resemblance even more stunning by increasing the similarity to the original artwork. This is a wonderful opportunity to obtain an ORIGINAL oil painting from one of the top exponents of the genre. This is not a photo, print or reproduction of any kind - it's an original oil painting, each brush stroke from the hand of the artist, Natalya McCafferty. Date of Creation: 2015. Technique: O il on canvas. Overview Painting. Since I am not familiar with the artist or origin of this oil painting, I can’t ask for the actual value of this item, and am therefore liquidating all these paintings at flat rate pricing based on size. It is from Lunenburg County. Henri signed lobster and crab oil on board painting MINT condition! Henri signed original lobster and crab still life oil on board painting. Excellent condition. Local pick up is available. "I paint things the way they look when I'm actually there", says Mr. Srite. "If I can see it, it's in the painting.". This subject was a sample giclee produced from the original in 2001 and only two were produced. We stretch-mount all our canvases using predried solid wood and we back staple for uniform and smoother side finishes. /Arrival Date. As beautiful as our Canvassed Arts are, and as near in appearance to the original artwork as they can be, you always have the option of making resemblance even more stunning by increasing the similarity to the original artwork. /Arrival Date. We stretch-mount all our canvases using predried solid wood and we back staple for uniform and smoother side finishes. As beautiful as our Canvassed Arts are, and as near in appearance to the original artwork as they can be, you always have the option of making resemblance even more stunning by increasing the similarity to the original artwork. Pivet’s studies included the prestigious Academie de Port-Royal in Paris. This is a hand signed original giclee on canvas titled “Coupe de Fruits” by Pierre Pivet. In Chetlamn England, 1987, he was the guest of honor at the Falcon Polo Club Queens Cup and painted a series of ‘Polo’ works for his solo exhibition. ALLA SALUTE! We stretch-mount all our canvases using predried solid wood and we back staple for uniform and smoother side finishes. As beautiful as our Canvassed Arts are, and as near in appearance to the original artwork as they can be, you always have the option of making resemblance even more stunning by increasing the similarity to the original artwork. 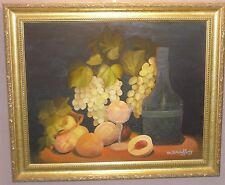 PAS 1976 signed original still life fruit and wine watercolor painting. It is signed on the bottom left corner. The painting is in excellent condition. Wine Bottle Painting. Nice estate item, typical wear, overall good condition. (01-492)s. We are not experts in any one field. 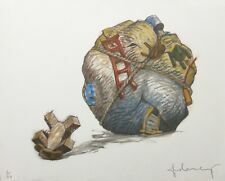 Anthony LaPaglia (1897-1993) NY signed 1966 pair of still life watercolors EC!